HOLLYWOOD SPY: WISHING YOU A VERY MERRY CHRISTMAS 2017 SPYLINGS! Wonderful Christmas wishes to you, Dezzy! 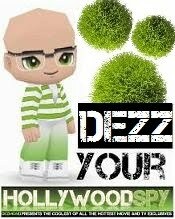 Have a great Christmas and New year Dez. thanks, Ray, all the best to you and your family! Merry Christmas Dezzie! Enjoy the Festive Specials. Hope you had a great time, too! Merry Christmas to you Dezzy. Wishing you the very best in 2018.